KDS Sedlčany provides professional maintenance of cutlery in a specially equipped workshop. This service allows extending life of worn-out products and returning their original cutting properties. You can send goods for sharpening by mail to the company address: KDS Sedlčany, Sedlecká 570, 26401 SEDLČANY, or bring them in person to one of our company stores or collecting points for sharpening. Delivery date of your order depends on the form of handover you choose. We will handle your orders received by mail within 3 working days and then send them back (cash on delivery 160 CZK). More informations about maintenance and servicing can be obtained by our production manager Mr. Josef Dvořák or directly by our experts from service centre - Mr. Robert Hercik or Ms. Pavla Lišková. Here can you download full pricelist - service and sharpening. Basically – everything that used to be sharp but got blunt by usage. 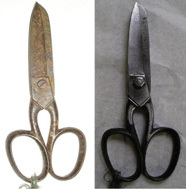 Scissors – These basically antique scissors arrived to our company in completely rusted and dull state. We restored them to near original condition which included a perfect blade. Secateurs - it is obvious that these shears were extensively used and had some hard time. Basically a classic example of a product delivered for restoration to our workshop. A treat for experts and a great satisfaction for customers. It is clear from the picture that the secateurs can function and cut again for many years coming. Butcher axe - we received this beautiful piece in a poor state - rusted surface, chipped and dull blades. After service by our experienced professionals, we posted back an axe unrecognizable from the original - the surface was polished and treated and the blade had perfect qualities.